There are many common mistakes newcomers often make, some at considerable expense to their pocketbooks, which need never have happened if a good expert was consulted beforehand. This section is presented to you in an effort to help minimize any costly mistakes to your pocketbook. It is best to develop a collection of the highest quality you can afford, based upon a particular theme that you enjoy, using the advice of the most knowledgeable and experienced specialist dealer in that particular field. You can gain from a lifetime of expertise this way with little time of your own. Now if you feel Mark Twain is a good choice, or think Mark Twain may be a great investment and fun in the process, then there are many different kinds of Mark Twain collectibles to chose from. Periodicals, first editions, variant bindings, clothing, letters & manuscripts are just some of the choices. Photographs and cigars even fit into some Mark Twain collections. It is all a matter of what you personally like, and what goals you have as far as a collection (or investment) goes. One topic in current book collecting circles is "the high spot collector" Vs "the specialized collector" debate. A high spot collector is one who exclusively collects the high spots of any particular topic. A high spot collector may stay on one theme like American literature (in which case 1st editions of Huckleberry Finn & Tom Sawyer are almost always on the list), or may mix various subject matters. High spot collections are sometimes viewed as being a haphazard mishmash of various outstanding items with no rhyme or reason to the whole. We are appreciative of the fact that Mark Twain is often included in many serious high spot collections, as this stands testimony to his importance as an American writer. The specialized book collector, on the other hand, strives to acquire all of the books printed in a particular field of interest. This results in a far more meaningful collection. It adds personality to the whole. Both the personality of the collector & the personality of the subject matter shines through. A special collection can be of great use to biographers, bibliographers, film makers, and scholars. Items that aren't even on the radar screen turn up when one specializes. One of a kind discoveries are often made as a result of specialization. A collection that focuses only on "high spots" can be likened to a collection of trophies in that they are each individual gems, yet the collection as a whole lacks the personality & sense of deeper purpose provided by a special collection. If you specialize your Mark Twain collection you'll derive a great deal more understanding of the man, his works, and the society he lived in. And, your collection could enrich the lives of others, too. Admirable Books specializes in Mark Twain collection development, and we are here to help you customize your collection. This is our primary focus because it leads to the highest customer satisfaction attainable by creating a collection that makes a bold statement about your personality & taste. If you have a Mark Twain book you think may be a first edition, the date on the front of the title page is what matters, not the copyright date on the back of the title page. The date on the front of the title page should no more than one year off the copyright date. Once the date is a match to the first edition, there are other minor "points" to consider specific to the title to determine how early an issue it is. For example the "i" in the word "this" on page 198 of an 1867 copy of The Celebrated Jumping Frog of Calaveras County should be perfect and unbroken to be an early issue. That "i" can mean the difference of many thousands of dollars. Another point for the Jumping Frog is page 198 wholly unprinted, which is a very rare variant. Even the placement of the frog on the front cover can mean the difference in thousands of dollars. 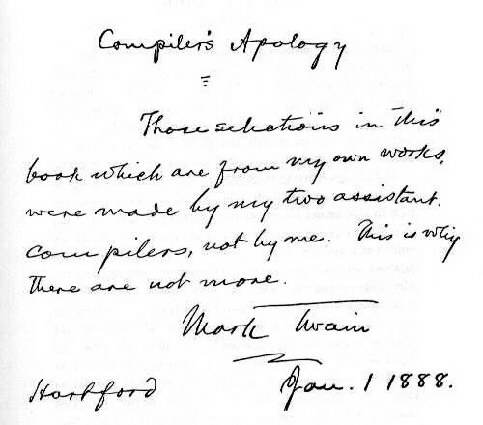 Apples compared to apples, condition is the name of the game in Mark Twain first editions. The books that look like they are unread and could have been made yesterday are the ones that are most sought after by collectors. first & later editions of A Tramp Abroad. 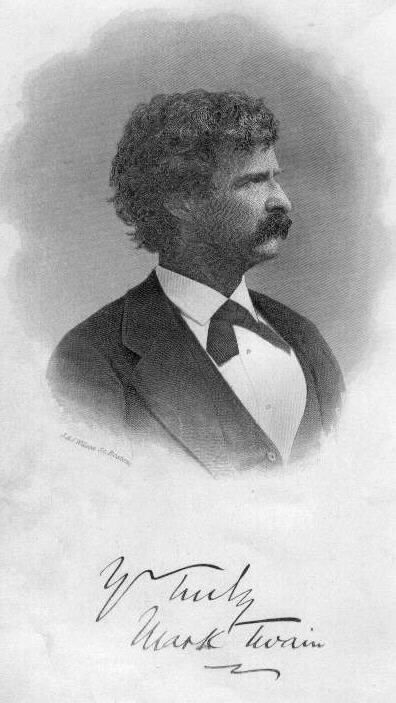 Books containing an illustration of Mark Twain with his signature underneath are mass produced printings, and are not actually signed by Mark Twain. 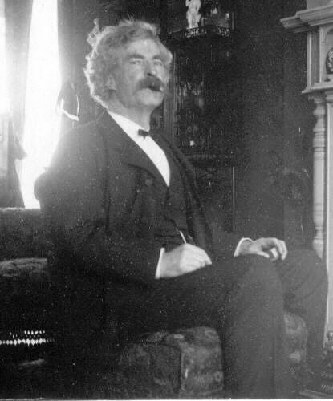 For example, first editions of Puddn'head Wilson, A Tramp Abroad, and Adventures of Huckleberry Finn all contain facsimiles of Mark Twain's handwriting. bound in any book it is printed, not actually handwritten. offered as the genuine McCoy so BEWARE! 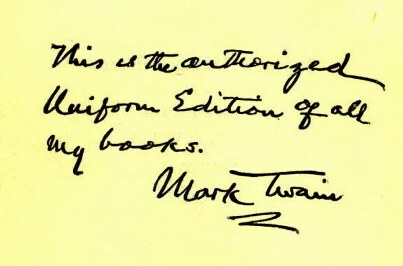 Tens of thousands of sets of the complete works of Mark Twain were made, the most common sets contain Mark Twain's printed endorsement which is a facsimile of his handwriting printed at the beginning of every single volume, "This is the authorized Uniform Edition of all my books. Mark Twain." All of these are printed. In areas of the Internet where anything goes, such as online auctions that offer no bona fide guarantee, these volumes have fetched upwards of $1,000 each! That company has rules against notifying a buyer or seller that an item is phony during or even after the auction, as it amounts to "auction interference" which is punishable by banishment from using their site. These books are actually only worth a few dollars. In the autograph world it definitely pays to deal with an honest, reliable expert. 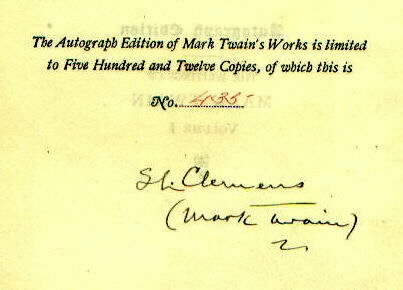 Several different, genuinely autographed sets of the works of Mark Twain were made, and these are easily identified by looking in the first volume which contains a printed statement at the beginning regarding the limitation of the autograph set which also contains a signature of S.L. 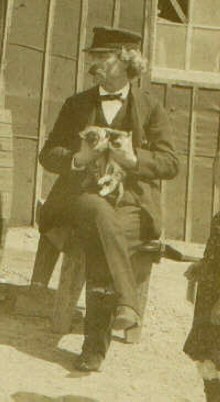 Clemens, underneath which is his signature as Mark Twain. Of course, to know for sure if you have a genuinely signed article you must obtain the evaluation of an expert, or become one yourself. 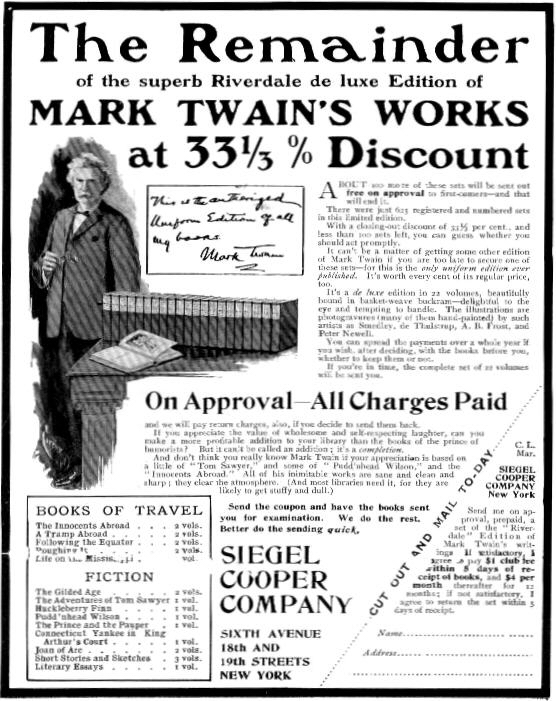 1904 advertisement for a 22 volume set of Mark Twain's Works. Over a million of these sets were sold by the time this offer was made to the public. What Types Of Items Should I Seek? It is best to collect something that is fun to you and within your budget. If you like Mark Twain's writings, you may find collecting him to be fun & profitable. 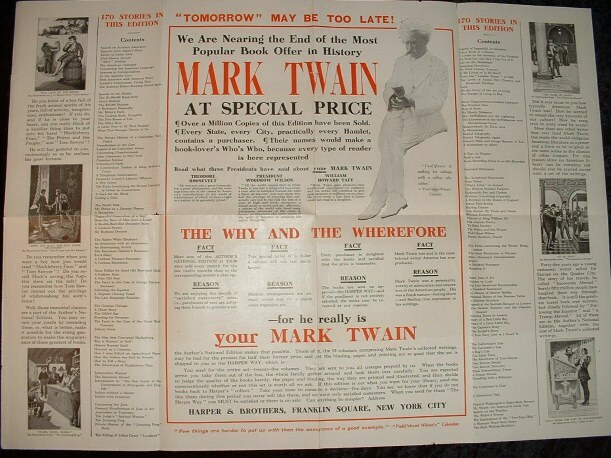 There are different categories of Mark Twain collectibles. Postcards, newspapers & other periodicals, first edition books, photographs, letters to, by, or about him (or his family), dinner menus, cigar boxes & labels, games, dolls, and much more. Admirable Books strives to help Mark Twain collectors acquire museum quality Mark Twain memorabilia of all types. 'tis the difference between lightning and the lightning bug."